Lion in a tree video. The lion is a magnificent animal that appears as a symbol of power, courage and nobility on family crests, coats of arms and national flags in many civilizations. Lions at one time were found from Greece through the Middle East to northern India, but today only a very small population remains in India. 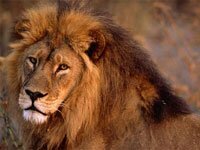 In the past lions lived in most parts of Africa, but are now confined to the sub-Saharan region. Lions are found in savannas, grasslands, dense bush and woodlands. 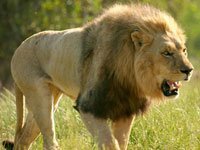 Cooperative hunting enables lions to take prey as large as buffaloes, rhinos, hippos and giraffes. Found in Africa and the Gir Forest of northwest India, lions are formidable hunters. Prides, composed of four to six females, work together to take down large prey, such as zebra, wildebeest, impala and buffalo. Hunting skills are developed as cubs through the use of play-fighting among relatives. 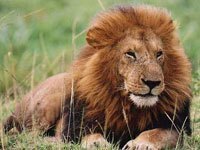 A lion's diet also consists of small rodents, hares and reptiles, which can be hunted and killed by a solitary lion. 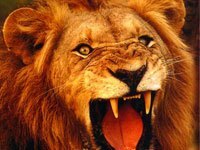 What are the natural enemies of the lion? Did You Know this about lions? While the male lion is off patrolling the pride's territory, the lionesses are the ones that do most of the hunting for the group. The wilds of Africa and Asia are host to a never-ending arms race between predator and prey. Even the formidable lion only makes one kill out of every five attempts. 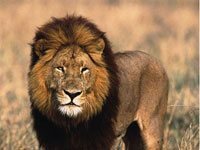 ost lions avoid water; their body temperature drops drastically when wet and oils in their fur that help keep insects away can be washed off. Yet, the lions of the Okavango Delta regularly take to the water to hunt and move from island to island. Lions often sleep for most or all of the day, especially in extreme heat. 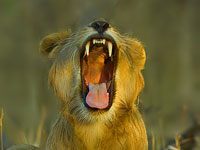 Download free Lion wallpapers, click on the image to open the large version. Print free Lion coloring pages, click on the image to open the large version.